The extinguishing of the Olympic flame recently signalled the end of the 30th Modern Olympic Games, which will be remembered for a long time by a lot of people in many respects. The British surpassed themselves, so to speak, with the organisation and running of the games. They proved just how important careful and detailed preparation is for every event. And this is no different for canine events, although even our biggest events can nowhere near match the participation and response levels of the Olympics, of course. You have to wonder why even little known sports can lure so many viewers to the TV screens while our major events, which undoubtedly exist, are mostly well and truly ignored by the TV stations. This topic was dealt with to some extent during the scientific symposium held last year, at which ways were demonstrated in which this aspect can be improved. It is now up to us to analyse and improve this situation. The likely answer to this question is “action”. Nowadays, this requirement would appear to be best met by the Agility discipline, which can usually also attract large numbers of spectators. 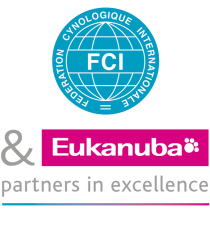 The FCI supports, via its members and contract partners, the well-being of all dogs worldwide. The FCI is definitely against any negative attitude and measure against stray dogs, no matter where this happens. After the BBC programme “Pedigree Dogs Exposed” the canine world will never be the same again. The media and governments will continuously put demands on pedigree dog breeders and Clubs. "... a piece of cake"
Pigmentary problems are often seen in dogs. The general approach is that they are difficult to diagnose with certainty and the use of biopsy and histopathology is more than useful. Svenska Kennelklubben (SKK) was founded in 1889 by Count Adolf Patrik Hamilton. He was also the president until his death in 1910. Count Hamilton gave his name to the Swedish breed, Hamiltonstövare (Hamilton hound). Sweden has in total twelve national breeds (nine are recognised by the FCI). Eukanuba is pleased to announce the Eukanuba World Challenge 2012. This globally recognised, prestigious event is to be hosted at the AKC/Eukanuba National Championship on 15th & 16th December at the Orange County Convention Centre in Orlando, Florida. The Kennel Club of Taiwan (K.C.T.) was established in 1990. The first edition of the show was organised in 1993. After two decades of development, the show entries varied from less than 200 dogs to 782 dogs (as of the FCI Asian and Pacific Section Show 2009).